The hour-long experiment from magician and UK TV mainstay Derren Brown asks a dangerous question with an unexpected twist. For a special that seems almost entirely geared to answer one climactic question, “The Push” is surprisingly spoiler-resistant. 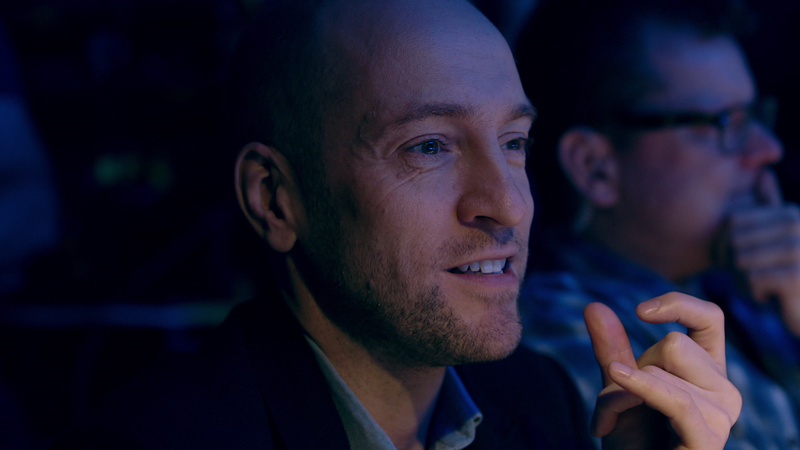 Magician/sociologist Derren Brown unveiled this elaborate TV experiment in the UK back in early 2016, but it’s just now making its way to the States via Netflix. Purporting to answer the question of whether or not a random individual could be psychologically coerced into justifying the killing of another person, the twisted entertainment of “The Push” comes in all the moments before that fateful ending task. The set-up is simple: Take one unsuspecting person, chosen for his human suggestibility, and lead him through a series of tiny tasks that slowly make him more perceptible to carrying out an unthinkable task. As the on-screen string-puller directing a cast and crew of hundreds through a thoroughly choreographed set of circumstances, Brown plays coy with whether or not the goal is to get main subject Chris to actually go through with it or to get him to the point where he can choose for himself. Chris starts off as a frog in a slow social boiling pot of water when he’s the only one at this charity gala not dressed up. (Clearly, Chris doesn’t follow the Jack Donaghy rule of post-6:00 p.m. evening wear.) From there, the tiny incremental changes in his expectations are almost as excruciating as the final moment when he’s confronted with whether or not to push. It would almost be funny if a considerable number of viewers (this writer included) didn’t recognize the strong people-pleasing impulse that gets slowly curdled over the course of an hour. In fact, there’s not much difference in the premise here than some of the more elaborate Nathan Fielder set-ups on the Comedy Central series “Nathan for You.” Gathering a bunch of people together for a charity where someone has to deliver a speech and everyone’s in on it except the one person talking played out very close to the “Chili Shop/Massage Parlor” episode from last year’s Season 4. The biggest change here is that Fielder’s deadpan voiceover explaining the various steps in the process has given way to a more earnest, devious Brown. For as much as Brown frames the bookends of the special as an altruistic call to action for anyone who happens to be watching, it’s hard not to see “The Push” and think of another memorable Comedy Central figure: Grant the producer from “Review.” Brown’s tiny reaction after saying, “Now he’s dragging a dead body without questioning it. This is good.” is straight out of the James Urbaniak evil grin playbook. Arguably, the tensest, most memorable moments happen before the final sequence on the roof where Chris has to make his big decision. Without getting too overboard with dramatic music stings and repetitive flashbacks, there’s likely going to be a more visceral response to the point-of-no-return moments that happen far earlier than that. The heavy breathing and the fearful pleading already show someone who’s gone three steps too far without even realizing it. That’s all aided by a presentation devoid of tension-cutting commercial breaks. In a move that shows how the special was conceived not only as a self-contained experiment, but as a similar test of the audience’s perception, “The Push” plays with the story’s timeline in a way that saves some key information for late in the game rather than going by a strict chronological timeline. Brown addresses the TV viewing audience directly at least once, asking them what you would do at any point in this process, but an even bigger question is how this doubles as a blatant, unapologetic form of manipulation and a carefully constructed piece of fascinating entertainment, both at the same time. Like any good magician’s work, there’s more than a bit of sleight of hand here. Aside from the carefully-placed trip to the special effects lab that created the fake corpse (a sly “Weekend at Bernie’s” joke that I’m only now just piecing together as I type this), the real wallop at the ending is the reveal that Chris was not the only one put through this test. Those final four possibilities, the headshots printed out on Brown’s desk during the casting process, were all subjected to “The Push” challenge. It’s no surprise that the team probably would have gone with one of the results of the evening shoot, even if Chris hadn’t proved to be the odd man out, as it were. If anything, the preceding hour of this special is a warning to carefully consider the information you’re absorbing and how it affects your willingness to go along with what’s being presented. Who’s to say that the other three actually went through this whole process, ending with them all deciding to push Bernie off? Maybe Chris is another willing plant, too, especially good at faking nervous sweating. Either way, those three pushes off the roof from the other three unwitting participants suddenly do the impossible: They make Chris the unlikely hero. (Dropping in the horrified groan when one woman reveals she kicked the Bernie corpse is a dark, dark piece of editing.) And the audience’s desire to see someone put through this ordeal — their relative enthusiasm or disappointment at the final outcome — is far more telling than anything Chris or the other applicants do. With a setup this elaborate and a final decision this complex, “The Push” was always going to be more than just a question of “Will he do it?” In a way, this special’s biggest twist is how irrelevant that answer actually is. Even for those who’ve already found out what happens through word of mouth or a quick Wikipedia search of the ending (or the preceding few paragraphs), “The Push” is one trick that deserves to be watched as it unfolds. “The Push” is now available to stream on Netflix.